There used to be The Edo castle in The Imperial Palace. 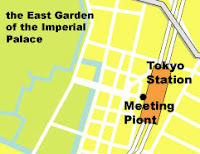 and the name of the place was changed to The Imperial Palace. so most historical buildings were burnt down. it remains the atmosphere of Edo period. Please come to the meeting point until 13:00 on Saturday. Our volunteer staff is standing at the meeting point holding a sign "Free Walking Tour"